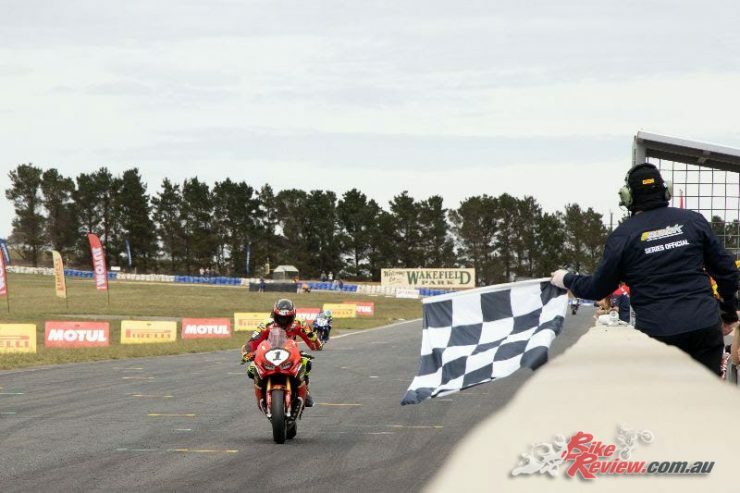 Goulburn local Troy Herfoss (Penrite Honda Racing, Honda CBR RR SP) set a new lap record and took out Race 1 of Kawasaki Superbike at Round 2 of the 2019 Motul Pirelli Australian Superbike Championship on Sunday. The defending series champion came from third on the grid to take the victory, ahead of Cru Halliday (Yamaha Racing Team, Yamaha YZF-R1M) and Wayne Maxwell (Team Suzuki ECSTAR, Suzuki GSX-R EL R). As the lights went out Maxwell snuck up the inside of polesitter Halliday to take an early lead. Front row starter Herfoss was behind, ahead of Halliday’s Yamaha teammate Daniel Falzon (Yamaha Racing Team, Yamaha YZF-R1M), and Josh Waters (Team Suzuki ECSTAR, Suzuki GSX-R EL R). A leading group of four emerged at the front, and on lap five Maxwell still held the lead from Halliday, Herfoss and Falzon. 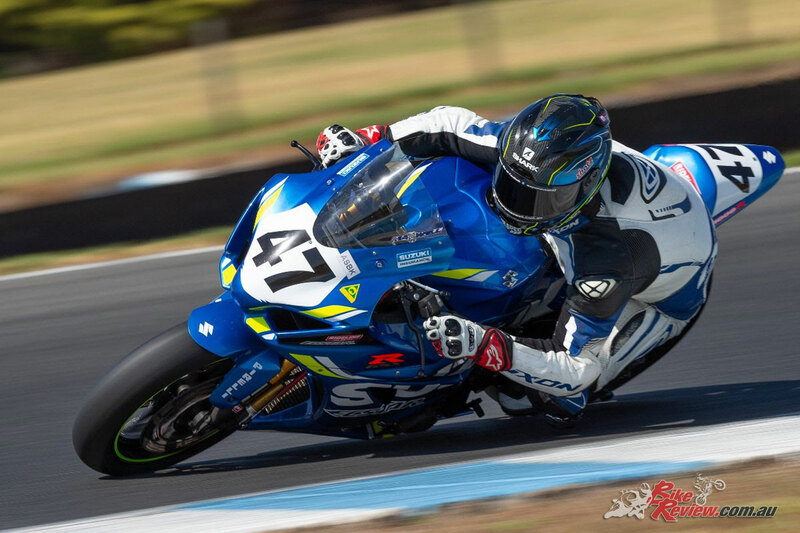 Aiden Wagner (Landbridge Racing, Yamaha YZF-R1M) had sustained a shoulder injury from Friday’s practice crash and withdrew from the race, in too much pain to continue. Herfoss struck on lap seven to find his way past Halliday, before he went off in pursuit of the leading Suzuki rider Maxwell. Josh Waters and Mike Jones (Desmosport Ducati, Ducati 1299 Final Ed.) were having a battle all to themselves in fifth and sixth, ahead of the Kawasaki pair of Bryan Staring (Kawasaki BCperformance, Kawasaki ZX10RR) and Matt Walters (Kawasaki Connection, Kawasaki ZX10RR) in seventh and eighth. The leaders were edging their way towards lap record pace and on lap eight they found it- Herfoss taking Maxwell’s previous lap record from 2016 (57.540) with a 57.525. Goulburn local Herfoss slowly reeled the leading Maxwell in, looking in ominous form on his home track. Halliday ran wide at turn four on lap 11 to let the pursuing Falzon through into third. Herfoss made a huge dive at turn 11 but Maxwell came back on the overlap to hold the lead. Herfoss tried it again on lap 13 and made the move stick, taking the lead ahead of Maxwell, then Halliday also having made it back in front of Falzon. After Herfoss took the lead he managed to pull out a gap over Maxwell, who was falling back into the clutches of Halliday in third. Halliday threw the bike up the inside at the final turn, managing to make the last lap pass on Maxwell to claim second at the final moment. The race finished with Herfoss on top, ahead of Halliday and Maxwell.